Price incentive saves £10,000. Now available for just !! Located close to the popular Sardunya beach restaurant in Karsiyaka this 3 bedroom 2 bathroom villa gives you that piece of Cyprus you long for. From a fully furnished lounge, to a fully fitted kitchen (oven hob, extractor fan, fridge-freezer, washing machine) with French doors to the terrace and three bedrooms upstairs (two of them with en-suite shower rooms and private terraces with sea and mountain views), you get to own a lovely piece of real estate. Enjoy a relaxing summers day swim in a private 8x4m swimming pool or take the family for lunch and a dip at the restaurant close to the sea only 50 metres away, or if you need a good investment opportunity then rent this property out for as much as £500 a week during peak season. Situated within short distance to many bars and restaurants on the coastal region of Kyrenia as well as being only 20 minutes from the city centre, historic landmarks and amenities; this 3 bed 2 bathroom villa definitely offers a quiet, yet scenic retreat while still being close to all you need. Triple aspect with double glazed PVC windows to front and side and patio door to side leading back to entrance area, detailed coving, tiled floor. Kitchen/Diner – (4.39m x 3.45m) 14' 5" x 11' 4"
Dual aspect with double glazed PVC windows to rear and patio doors to side leading out to rear garden and swimming pool, detailed coving, combination of eye and base level fitted units, ceramic splash back tiles, dual stainless steel sink with mixer tap, roll top work surfaces, freestanding oven and hob, extractor fan, fridge freezer, tiled floor. Double glazed PVC window to side, ceramic tiled walls, and pedestal wash hand basin with mixer tap, low level WC, and tiled floor. Marble staircase with wrought iron balustrade and double glazed PVC window to side. Dual aspect with double glazed PVC window to front and patio doors to side leading to balcony, detailed coving, wall mounted air conditioning unit, range of fitted wardrobes, tiled floor. Double glazed PVC window to side, ceramic tiled walls, wall mounted mirror, shower cubical with shower head and mixer tap, pedestal wash hand basin with mixer tap, low level WC, and tiled floor. Dual aspect with double glazed PVC window to side and patio doors to rear leading to balcony, detailed coving, and wall mounted air conditioning unit, range of fitted wardrobes, tiled floor. Double glazed PVC window to side, ceramic tiled floor. This lovely house in the beautiful village of Karsiyaka will only appreciate with time as development increases in the city. Many buyers are already looking to escape the hustle of city living and retreat to quieter locations while still having a foot in town. 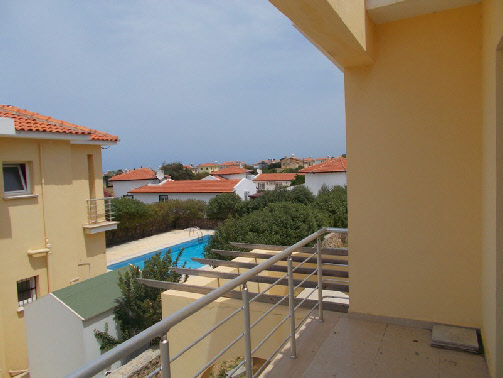 Property prices are estimated to increase as North Cyprus becomes a choice destination for more travellers. Estimated rental figures for this 3 bed home would be at around £500 to £600 per week during the peak holiday season and £450 to £500 monthly for long term rentals during the off-peak season. The property is in Lapta but right on the border with Karsiyaka . Karsiyaka is located to the west of Kyrenia and consists of the village itself nestled in the foothills of the Besparmak mountains, the “square” or Ataturk Park along the coastal road and the coastal village itself. The village offers stunning views of both the sea and of the second highest mountain in the Besparmak mountain range. The village of Karsiyaka is famous for its historical monastery that sits high up in the mountain. You will find life goes on in the village pretty much the same as it did years ago, with the area still relatively undeveloped and perfect for those wanting to get away from it all. Karsiyaka has flat land along the coast that stretches 2 to 3 miles from the sea and up to the steep Kyrenia mountain range. You will find two excellent restaurants at Karsiyaka bay, a large beautiful bay mostly secluded.